Sunnyside Up! What a great way to kick start the day in New Zealand's very first capital, especially with these blissful ocean views! 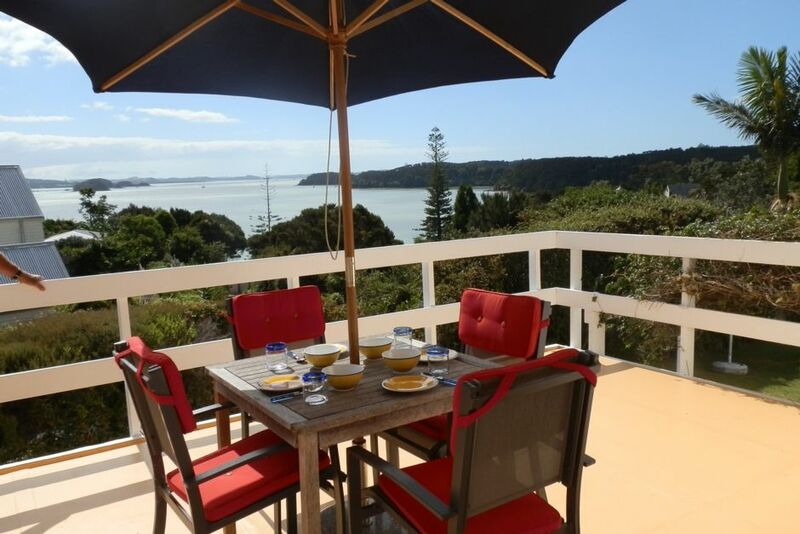 3brm home with a stunning water outlook from the sun soaked deck. Relax in the sun while gazing across the sea, could it get any better!? Get away from the hustle and bustle - Put your feet up! They call it the Sunny Bay of Islands and Sunnyside Up is where you will certainly feel the sun on your back! For a cosy, winter retreat in Romantic Russell, Sunnyside Up boasts a warm log fire and even has a bath to really help you unwind! Sunnyside Up is a peaceful and relaxing home with plenty of privacy! Just 7 minutes’ drive from Russell Township where you will find our amazing waterfront cafes and restaurants. If it’s a weekend of Adventure you are after – Visit the Hole in the Rock, take a ride on the Dolphin Explorer or a cruise through the 144 islands of the Bay. Perhaps a fishing charter to catch fresh fish for dinner! If you like the sound of a tour, just let us know as we are happy to book on your behalf. Sunnyside Up accommodates a maximum of 6 guests – With plenty of parking for the boat and cars. *NOT suitable for toddlers and small children due to the decking not being fully enclosed. Looking for an all inclusive package? Ask us about our add-on services and all inclusive package offers! Perhaps you would like a bottle of bubbles with cheese and crackers waiting or a picnic hamper ready made? *Special rates may apply. Enquire now. Fantastic place to stay, Russell, what beautiful place! Fantastic place to stay, Russell, what beautiful place!! Absolutely a stunning place with great hosts. Absolutely a stunning place with great hosts. We will definitely be coming back and will recommend to anyone going up north. Great little bach on Okiato. Great little bach on Okiato. House is tidy with a new bathroom. Bedrooms are decent size with lovely linen. Lovely view of the ocean in a nice quiet part of the BOI. Excellent property, great location, found Tracey very pleasant and easy to deal with.